Item is Brownie No. 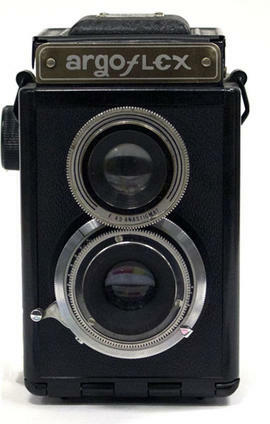 2 Model F box camera that used 120 film to make pictures 5.7 x 8.25 cm in size. 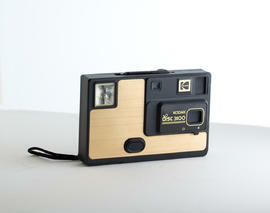 It has a leatherette covered aluminum body and a simple lens with 3 aperture settings and a rotary shutter. 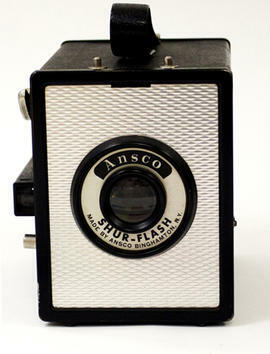 Item consists of a red Kodak Brownie StarFlash camera. 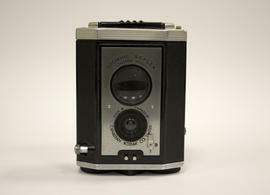 It was manufactured by the Canadian Kodak Co., Limited in Toronto Ontario, and produces 4x4cm images on 127 film. It has a plastic body and built in flash. 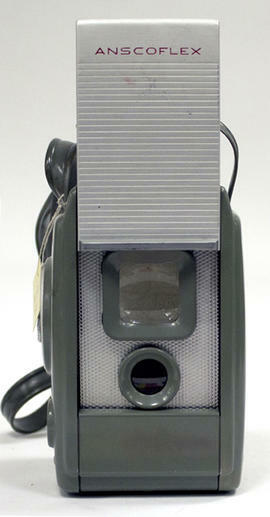 Item is a mass produced Bakelite camera for 127 film format, designed for Kodak by Walter Dorwin Teague. Simple lens on helical extension tube, only one shutter speed. Collapsible frame viewfinder on top of camera. Red film counter window on back. 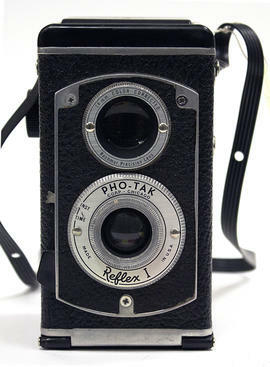 Item is a small, Bakelite camera for 8 exposures on 828 format roll film (developed by Kodak in 1935 and similar in size to 135 film, without sprocket holes). The camera features a simple viewfinder, 51mm f 4.5 lens and a 4 speed Flash 200 shutter.